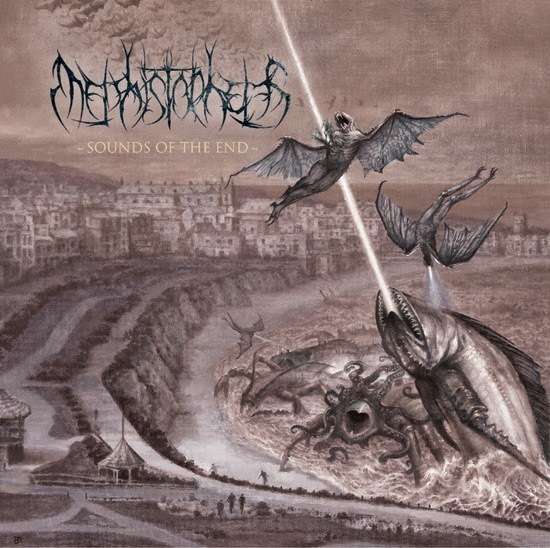 Metal Underground bids you harm and ill will this weekend with a stream of Sounds of the End, the forthcoming new full-length from Tasmanian technical death metal horde, MEPHISTOPHELES. Featuring former members of Spawn of Possession, Psycroptic and Space Raven among others,MEPHISTOPHELES fuses their collective penchant for Athiest, Deeds of Flesh, Opeth, Cynic and Deicide into a flesh-eating hailstorm of intricately structured, sonic brutality. Sounds of the End was recorded at Red Planet Studio with Jake Long and expels unmitigated hell upon its listeners with some of the band's most brutal, intricately arranged, and psychologically deranged work to date. Expands vocalist Matthew "Chalky" Chalk (formerly of Psycroptic): "I love being part of this band. The music is fun, the guys are awesome, and the best thing, there are no boundaries. If we want to throw in any riff from left field, we do it. Obviously, we have a direction, and a loose idea of what we want to achieve, but it's a big field to play in. I think people will hear the freedom in the music, and the freshness in our approach, and will appreciate the authenticity in what we're doing. If you like black metal, death metal, tech/death, or avante-garde... you'll more than likely find something in what we do that is to your liking. I encourage any fan of extreme music to put 45 minutes aside, and listen to what we have done here, because you just might like it...Hell, some of you might even love it!" Get brutal with Sounds of the End, courtesy of Metal Underground, at THIS LOCATION. Sounds of the End will deafen North America on October 1, 2013 via Willowtip Records. For preorder, point your browser HERE.